Grout - finishing of tile walls. Grout is applied to tile joints to create a perfect surface and to prevent moisture penetration into the joints. In addition, properly chosen grout can mask the defects in the tiles on the corners, chips and cracks. Before applying any make-up you need to properly dissolve. Do not breed from the entire bag. Measure the desired amount for the work (about 0.5 kg), grout dries quickly, and further adding water greatly spoils its protective properties.Prepare a small container with a lid. Pour the required amount of water (see directions) and sprinkle in there dry mix grout. Mix thoroughly with a trowel mix with a spatula or mixer until smooth and elastic mass. Leave the grout for 5 minutes to swell, then stir again and immediately use. Prepared grouting mixture maintains its properties for 2 hours at a temperature of 200 C in a closed lid container.Before applying the grout between the tile seams need to be properly prepared them for work. The joints should be free from dirt and dust, wipe with a wet sponge. After the grout has hardened, after 10-12 hours, the excess must be removed from tiles with a damp sponge.To prevent contamination of the joints or change their color, the grout should be primed with special primer to welds. The seams are primed after drying of the grout with a thin paintbrush. Grout is epoxy and cement-based. Epoxy is prepared exclusively according to the instructions, the plastic has a transparent texture, does not prevent the penetration of light, but protects from moisture, prevents the development of fungi and mold. Epoxy grout suitable for glass mosaic. 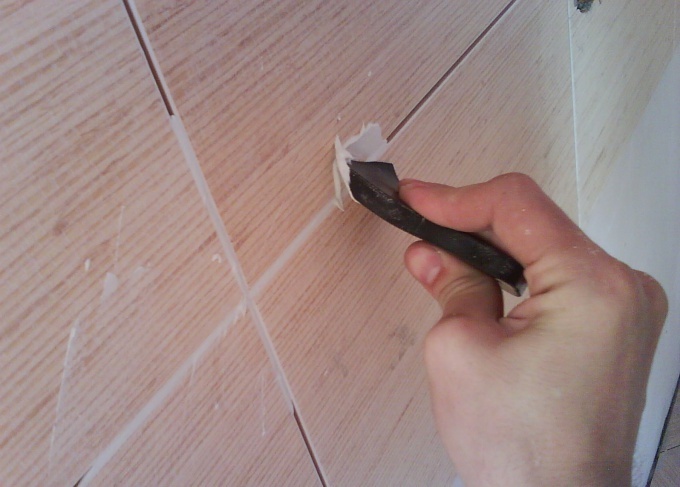 Usually, this type of grout used for finishers-professionals. After applying the epoxy grout, the excess should immediately be removed from the tiles with epoxy solvent. Otherwise, it will be impossible to get off. At home more popular cement grout. It is made on a cement-sandy basis, modified polymer additives and sold in the shops of building materials, has a variety of colors and easy to use.